The tips on reducing lag have been moved to https://alttd.com/lag and the requirements for warps have been moved to https://alttd.com/warps. We’ve also added some new information about how to use the warps on that page as well. The blog is back at https://alttd.com/blog and we will now post all of our announcements on both Discord AND the blog. This gives everyone a place to access the server’s news if they are unable to get on Discord, or don’t have a Discord account. Finally, the changelog is back on Discord at #changelog. We will post all changes we make to the server that effect the community in some way in the changelog. The official Altitude forums are back by popular demand! Many of you have requested a way to share ideas, show off creations, collaborate with others, and communicate with staff in a more organized way than Discord. We’re excited to announce that our forums have officially re-opened and are ready for all of that and more! The forums will now be the official place to report bugs, suggest ideas and events, advertise what your shops and towns, and more. We will also post all of our announcements and the changelog to the forums as well, so you can access them from anywhere – even if your not on Discord. The forums will now be the official place for us to post future announcements and updates. We will not be posting to the blog anymore. 1. You should only use play.alttd.com to connect to the Minecraft server. Do not use mc.alttd.com or anything ending in .net. 2. You should be using alttd.com/map to get to the dynmap. If you are using our old subdomain (map.alttd.com) you are just being redirected to address above, and recently that redirection broke for 2 weeks. 3. The same thing above applies to ANY of our old subdomains. If you are using <something>.alttd.com to get to any of our stuff, please change it to alttd.com/<something>. (Except the donation store, that one is still donate.alttd.com). 4. Finally, please make sure you are using alttd.com. We own the .net address, but never wanted anyone to use it, we only bought it just-in-case, and we are NOT renewing it next year. I’ve just changed our nameservers (this is who manages our domain and all connections to it) from CloudFlare to Google. Any DNS change, such as this one, can take time to fully prorogate through the internet. Some users may see the website or Minecraft server as offline for short period. It is not actually offline! If you see if offline you can try clearing your cache, and even try changing your DNS servers to Google’s (8.8.8.8 and 8.4.4.4), but you may just have to wait it out. It will fix itself. Hello everyone! With 1.13 just around the corner a lot is about to change around Altitude. We’ve spoken a lot about our plans for 1.13 and Altitude, but there will also be some unplanned changes coming up. I’ve recently been thinking about the server and I’ve decided it’s not in the best shape. I’m going to be implementing some changes with the goal of strengthening the community feel around here and reducing our focus on being big and famous. I think one of the biggest things I can do to fix the state of Altitude is to simplify things. I’m going to be tackling our rules soon, and Patreon has been changed (yes, again) to have three simple tiers now, all with the same perks. All Patreons will get a colored name on Discord, and a [P] tag in-game, as well as a sign on our Patreon tree in spawn. You can pledge $5/m, $10/m, or $15/m. We’ve also just implemented a new chat filter on the server, and on Discord, that will hopefully simplify things in that department. Moving forward, almost all words will be allowed, except for a few slurs and a couple very inappropriate topics. The server will track usage of all of inappropriate language, but won’t step in unless usage becomes very excessive – just to prevent people from abusing it when staff aren’t online. Basically, you can use this language however you normally would outside of Minecraft. Additionally, there is a filter on the Discord now that will delete messages with the always-blocked words (slurs and very inappropriate topics). One of the most requested changes on Altitude is for claims to expire sooner so that the abandoned homes can be looted and the land can be reclaimed. We’ve now implemented a 60 day expiration for all claims (30 days less than before). This means it is super important that you log in for at least a few minutes once in a while if you plan to be gone for a long time! Finally, our rules have been updated to reflect our new 1.13 policies! They are simpler, shorter, and there are fewer of them. Please review these rules at https://alttd.com/rules, because playing on the server means you agree to follow them! There shouldn’t be any surprising changes. Most of the rules have only been re-written to make more sense. The chat rules have been shortened up quite a bit, but I think the new chat rules, while pretty straight forward, encompass a lot of the same stuff as before.Our in-game survival guide, claiming guide, and website homepage have also been rewritten, so keep an eye on them too. That’s it for changes thus far. As always, these new features are implemented while they are being tested so that everyone can share their feedback on them. If you have any suggestions please reach out! Let’s Bring Our Forums Back! Did you know we have a public forum? Yeah neither did we. It seems like the entire server has completely forgotten about our poor forums, and we want to change that! With the recent additions to the server there are several things that will work better in the forums than anywhere else. Take a look below to get some ideas, and lets bring these forums back to life! Buying, selling, and trading. With the new economy in place many players are looking to get the word out that they have certain items or services for sale. The forums Marketplace is a great place to advertise your shop, sell your old home, or offer a service on the server. As the forums grow we will expand the market as necessary! Find new people for a project, town, or anything else. If you’re looking to start a new project in survival or creative this may be the best way to collaborate with others and get it out there that your looking for help. Sharing places of interest. Did you find an amazing location on the server that is beautiful to look at or would be a great place to build? Or did you finally finish your project and want to share pictures of it? The Places Of Interest subforum is a great place to do so. If you have any ideas for how we can improve the forums please let us know! We want to expand the forums to fit our server as best as possible and we hope to find even more uses for the forums with your feedback! We’ve heard your complaints about a couple of our voting websites and we’ve fixed them! One of the websites wasn’t registering your vote for a couple of hours, so we replaced that website with a new one. The double XP reward should work again! 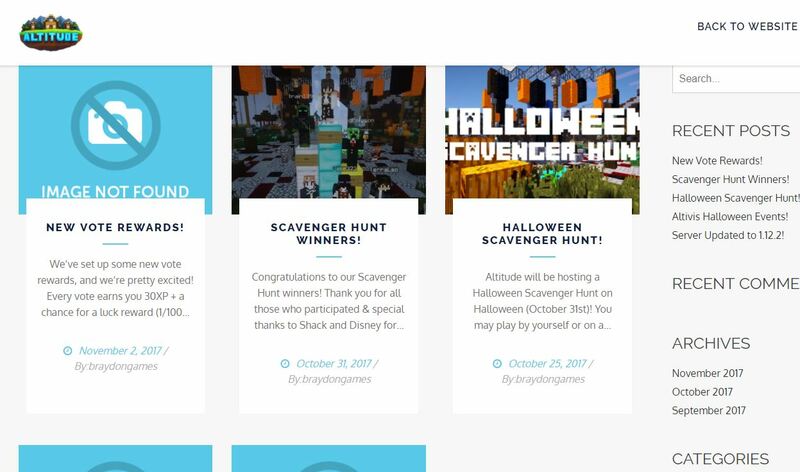 We ALSO heard that some people were having troubles voting on minecraftlist.org because it had a 24 hour cooldown unlike some of the other sites that reset the cooldown every day at midnight. This meant that if you voted at 3PM you couldn’t vote again until 3:01PM. We’ve spoken to this developer and they’ve decided to test out a midnight reset with our server as the pilot (the first to test it)! This was very generous of them to do, and it is important that we give them feedback on the program! PLEASE, vote every day and let me know if that website is working better now! Welcome to our new blog! Notice anything different? I’m very excited to announce we have a brand new website, including our blog, written from scratch and hosted on our own servers! This has been a project for a couple months now, and I’m super excited to finally release it. The new website will look very similar to our old one at first, but it is much more efficient, faster, has a better responsive design with less bugs, and a bunch of back-end changes that benefit the website as well as the server. Now that all of our websites (the main website, blog, forums, map, etc) are on the same web-server we can begin integrating them on a much deeper level, which will benefit our SEO as well as user experience when navigating our site. Previously, the main website was hosted separately from everything else and you needed to visit each site by going to <directory>.alttd.com (bans.alttd.com, forums.alttd.com, etc). Now, you can visit them all and stay on the main site (alttd.com/bans, alttd.com/forums, etc). All of our files, like images, are now hosted locally which means all of our websites will load this data much faster. In fact, the home page now loads in roughly 500ms (after your first visit) whereas previously it would have taken around 2 seconds. The home page is also 1.3MB instead of 5.3MB, which means much less bandwidth usage for you mobile users. One of the most exciting changes is to the blog itself. We are now hosting a local copy of wordpress that we can configure any way we wish. This will allow us to add additional users to the blog (more editors! ), customize the theme easily, and more easily create new content for you. Previously, to add a blog post on Weebly we would need to sign into Weebly.com, open the website editor, navigate to the blog page, and click on new post. Now we can just sign in at alttd.com/blog and click “new post”. Explore our new website at https://alttd.com and let me know if you find any bugs.